I'm starting a project next tuesday. Rewiring an old k&t house. It is a 2 story brick, approximately 4k sq ft. Basically changing out existing stuff, not too many upgrades. They are also doing a lot of replumbing and having a completely new hvac system installed. I've never tackled a project this size, or with this much lathe and plaster. It is completely time and materials with a high end estimate. The attic is open and it is on a full basement. Actually the house is 3 stories with this figured in. What is the best way to take on this thing and do it most efficiently. I did inform the homeowner that some demo would be necessary. A good news is that hopefully I can get in before the hvac guys and won't have to work around their pipes the whole time. The last one I did I was glad the plumber was in first they cut a lot of access's that I utilized. Work it just like eating an elephant: one bite at a time. That job will take a while, but with patience it can be done. Sometimes the best way to route wires is not the most direct route, so figure in some extra romex. I did a 2 story with a basement, and the only way to run the 3 conductor for the stairwell was down from the switch to an ac chase, up into the attic, then back down into the upstairs switch, almost 100 extra feet of wire to avoid a massive amount of demo in the center of the house. Point is it can be done, take your time and look at all your routing options before settling on a path. Gee, the tool merchants drool over jobs like this! Your choice is between fussing & cussing every inch of the way - or buying lots of new toys! Get the best Rotozip you can find, and fit it with solid carbide milling cutters. Might get a cordless one too, for the odd job off in a dark corner. Finally, there is a 'sled' that lets you use the rotozip like a saber saw. There's no better way to cut plaster & lath. Belay that. There IS a better way - and the tools are finally making their way over from Europe. "Flex" is one maker of a tool that can be best described as a circular saw with two blades spaces about 3/4" apart. Just what you want for cutting in your chases in the walls. However you do it, you'll want to invest in BOTH a drywall-specific vacuum (with HEPA filter, maybe $150) AND an air cleaner (fan with a filter to catch airborn dust). I can't see doing a 'complete rewire' without your having to add several new circuits, etc. For making simple holes there's nothing that beats an impact driver. Milwaukee even makes a big one (7/16" hex collet) for driving the selfeed bits through lumber. The multi-master is divine for the occasional slot or rectangular hole in plaster & lath. Another thing I would do is to try and plan ahead. If you are going to rewire the kitchen this month and a room on the second floor next month, maybe you can pull some extra wires to be used in the future. That would also go for the low voltage and telco wires. I bet you will find it easier if you have a sub panel on the upper floor serving the attic to keep your branch circuits shorter. Then you are only running a feeder top to bottom. Another handy fishing tool is a magnet on a piece of 10ga solid wire. You can bend that around corners to snag the chain you drop down from above in a wall. About 3 feet of steel bead chain on the end of nylon string works well for this. Use that to pull down a more sturdy cord to pull the cable in. I use an old rare earth magnet from a disk drive. Those HD magnets are STRONG!! I have a few that secure various things to my metal storage cabinet in the garage!! Never thought of your idea Greg. You ever think of sending it in to 'Ideas that work' at EC mag? Back in the days, I use a wad of string down, and a short piece of fish tape & wasted a lot of time ccasionally. BTW, did you think of making a 'small' pilot hole to assist in locating your missing NMC? A quarter inch fish tape gives a little more control and strength if you need to push up, or through insulation. 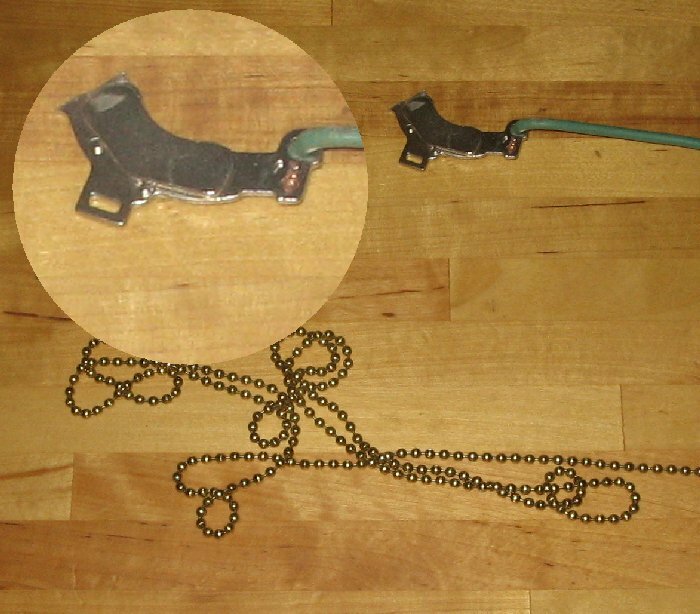 A fine chain is good for dropping down a wall and it can be fished out a small hole at the bottom with a wire. A flex bit can save time, but it can also pop out of a wall in a less than desirable place. Reno, I am probably in the middle on the tools. I like to have the right tools for the job but I am not a tool magnet, requiring the latest and the greatest. That being said, I did look at the Flex cutter. That is a good looking tool, but it should be for $600. I will get the carbide bit for the rotozip and probably a carbide hole saw. Hmmm....maybe upgrade to a battery rotozip.... I actually had the dewalt until it was stolen. I miss that thing. Where do you get the magents? That is a good idea. I can't imagine there being any insulation in the walls. That would work well. They're known as NIB and can be found endlessly on eBay. Otherwise, bust open an older disk drive that is junk to you. The NIB is used on the swing arm as a DC-Stepper. They're best used as stud finders. If tin you're golden, always. If wood then you're going for the nails/screws. I've found manny an install that skips studs like crazy.... to include exterior insulation! There are a host of videos at the above link.